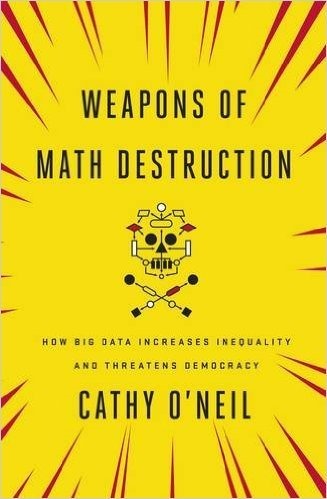 Obviously for any UK anglophone the title of Weapons of Math Destruction: How Big Data Increases Inequality and Threatens Democracy by Cathy O’Neil is going to be a bit grating. The book is an account of how algorithms can ruin people’s lives. To a degree the “Big Data” in the subtitle is incidental. Cathy O’Neil started her career as a mathematician before worked for the Shaw Hedge Fund as a quant before moving to Instant Media to work as a data scientist. It’s nice to know that I’m not the only person to have become a data scientist largely by writing “data scientist” on their CV! Nowadays she is an activist in the Occupy movement. The book is the result of O’Neil’s revelation that algorithms were often used destructively, and are responsible for gross injustices. Algorithms in this case are models that determine how companies, and sometimes government, deal with their employees, customers and citizens; whether they are offered loans, adverts of a particular sort, employment, termination or a lengthy prison sentence. The book starts with her experience at Shaw where she saw the subprime mortgage crisis from quite close up. In a nutshell: the subprime mortgage crisis happened because it was in the interests of most of the players in the industry for the stated risk of these mortgages to be minimised. The ratings agencies were paid by the aggregators of these mortgages to rate their risk, and the purchasers of these risk ratings had an interest in those ratings to be low – the ratings agencies duly obliged. The book goes on to cover a number of other “Weapons of Math Destruction”, including models for recruitment, insurance, credit rating, scheduling (for work), politics and policing. So, for example, there are the predictive policing algorithms which will direct the police for particular parts of town in an effort to reduce serious crime but where the police will consequently record more anti-social behaviour which will lead the algorithm to send them there again because it turns out that serious crime is quite rare but anti-social behaviour isn’t (so there’s more data to draw on). And the police in a number of countries are following the “zero-tolerance” model which says if you address minor misdemeanours then more serious crimes are fixed automatically. The problem in the US with this approach is that the police are sent to black neighbourhoods repeatedly (rather than, say, college campuses) and the model is self-reinforcing. 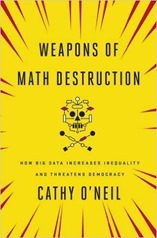 O’Neil identifies several systematic problems which are typically of Weapons of Math Destruction. These are the use of proxies rather than “real outcomes”, the lack of feedback from outcomes to the model, the scale on which the model impacts people, the lack of fairness built into the model, the opacity of the models and the damage the models can do. The damage is extensive, these WMDs can lead to you being arrested, incarcerated for lengthy periods, denied a job, denied medical insurance, and offered loans at most extortionate rates to complete courses at rather low rate universities. The book is focused almost entirely on the US, in fact the only mention of a place outside the US is of policing in the “city of Kent”. However, O’Neil does seem to rate the data and privacy legislation in Europe – where consumers should be told of the purposes to which data will be put when they supply it. Even in the States the law provides some limits on certain types of model (such as credit scoring) but these laws have not kept pace with new developments, nor are they necessarily easy to use. For example, if your credit score is wrong fixing it although legally mandated is not quick and easy. Perhaps her most telling comment is that computers don’t understand fairness, and certainly don’t exhibit fairness if they are not asked to optimise for it. Which does lead to the question “How do you implement fairness?”. In some cases it is obvious: you shouldn’t make use of algorithms which explicitly take into account gender, race or disability. But it’s easy to inadvertently bring in these parameters by, for example, postcode being correlated with race. Or part-time working being correlated with gender or disability. As a middle aged, middle class white man with a reasonably well-paid job, living in a nice part of town I am least likely to find myself on the wrong end of an algorithm and ironically the most likely to be writing such algorithms. I found the book very thought-provoking, it will certainly lead me to ask me whether the algorithms and data that I am generating are fair and what the cost of any unfairness is.